Hand breaded, fresh jalapeño peppers stuffed with our smoked trout and cream cheese blend, fried to golden brown. Served with Gaston’s popper jam. Filets of rainbow trout brined and slowly smoked in-house. Served with a remoulade sauce. Six hand breaded jumbo shrimp fried golden brown and crisp. Served with cocktail sauce. Six jumbo shrimp served chilled with cocktail sauce. Battered mozzarella cheese, deep fried to a golden brown, and served with marinara. Stuffed with bacon, green onions, and melted cheddar cheese. A rich creamy blend of fresh spinach, water chestnuts, artichoke hearts, cream cheese and spices. Topped with provolone cheese and served with crisp corn tortilla chips. 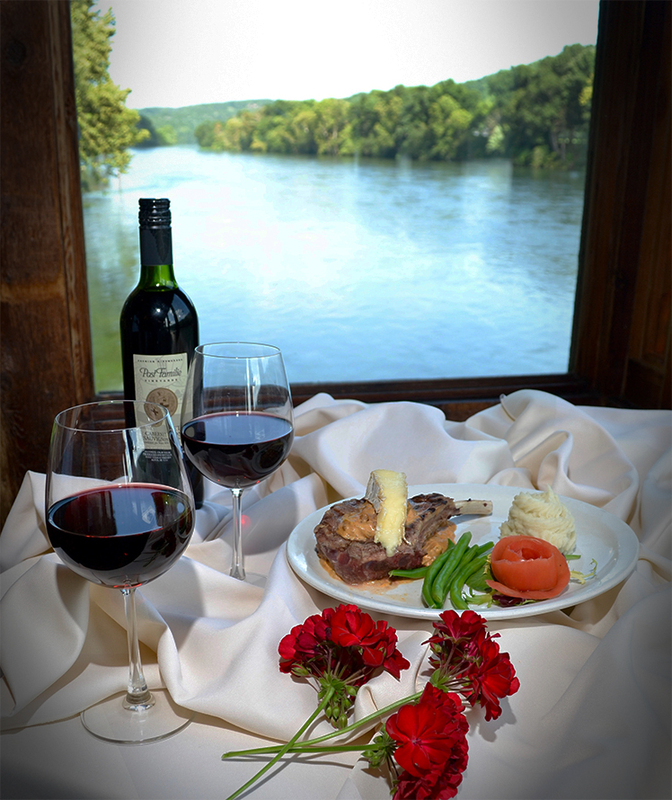 Served with your choice of river chips or fries. Thinly sliced, lean corned beef stuffed in grilled marble rye with Thousand Island dressing, sauerkraut, and melted Swiss cheese. Hickory smoked in our own special sauce and served on a toasted bun with a pickle. Grilled chicken, mixed greens, swiss, tomato, red onion, and pesto mayo rolled in an herb tortilla. Roasted turkey, cracked pepper, cheddar, avocado, mixed greens, and honey dijon rolled in an herb tortilla. Sliced roast beef served open face with brown gravy and mashed potatoes. Tender roast beef, and provolone cheese, served on a grilled french roll with au jus. Crisp bacon, lettuce, tomato and mayo served on wheat berry toast. Boneless breast of chicken grilled or fried and served on a toasted bun. Classic triple decker: turkey, ham, bacon, lettuce, tomato, swiss, and mayo served on wheat berry toast. Steamed french bread stuffed with roast beef, ham, turkey, cheddar cheese, tomato, sweet onion, dijonnaise sauce, shredded lettuce, and a dusting of black pepper. All entrées served with Salad Boat, your choice of potato or rice, and vegetable du jour. Available in full and half racks. Lightly breaded Texas style. The beef steak is fried golden, and served with mashed potatoes and white pepper gravy. 8oz. USDA certified Angus beef tenderloin marinated with herbs, garlic, and olive oil, char-grilled to your desired cook. Iowa Premium® beef is from a small localized feed lot that has a longer feed lot time and more stringent guidelines. Hand cut and marinated with fresh herbs, garlic, and olive oil, char-grilled to your desired cook. 8oz. filet mignon, char-grilled, served with a broiled lobster tail and drawn butter. All pasta served with Salad Boat and garlic toast. Lightly breaded boneless breast of chicken served atop a nest of linguine, marinara, and finished blend of melted Italian cheeses. Blackened chicken with bowtie pasta, tossed in a Cajun Alfredo sauce. Linguine pasta tossed with pesto, parmesan cheese, cracked pepper, capers, chicken broth, and adorned with a pan-seared salmon filet. Parmesan cream sauce with a hint of garlic, served over fettuccine. Consuming raw or undercooked seafood, shellfish, or meats may increase your risk of food borne illness. Our 1/2lb burgers are fresh ground 100% Angus brisket blended with Angus chuck and are char-grilled to your desired cook on a toasted bun. Served with crisp bacon, sliced avocado, battered onion rings, and melted cheddar cheese on a toasted bun. Char-grilled burger topped with slived tomato, melted chevre cheese, and a dollop of basil pesto. Topped with sauteed mushrooms and melted big eye swiss on a toasted bun. Mixed greens, grilled chicken, toasted almonds, sundried cranberries, tomatoes, cucumber and blue cheese crumbles, tossed in balsamic vinaigrette. Crisp romaine, croutons, and parmesan cheese, tossed in a zesty caesar dressing, topped with chicken. Mixed greens, grilled chicken, diced bacon, blue cheese crumbles, hardboiled egg, tomatoes, cucumber and red onion, served with your choice of dressing. A crispy tortilla shell filled with shredded lettuce, black olives, cheddar cheese, scallions, grilled blackened chicken breast, and fresh avocado, served with a side of salsa and sour cream. Mixed greens topped with sliced black olives, crumbled house made smoked trout, chevre cheese, grape tomatoes, and toasted walnuts, served with your choice of dressing. Hand breaded boneless chicken breast and mashed potatoes smothered in white gravy. Local favorite lightly seasoned, dusted in herbed flour and pan seared to golden brown. Hand breaded in cornmeal and fried to golden brown. Served with coleslaw, hushpuppies, and choice of potato. Yellowfin tuna steak dredged in a blend of chopped pecans and a zesty blend of New Orleans spices, then pan seared rare. Served with Asian dipping sauce and wasabi. 8 oz. filet marinated and char-grilled. Topped with dill butter. Hand breaded and fried to golden brown. Jumbo Shrimp sautéed with green onions, mushrooms, diced tomatoes in garlic butter white wine sauce. Broiled to perfection, served with drawn butter. Rick graduated from Mountain Home High School and furthered his education at Washborn Trade School, where he graduated first in his class with a degree in the Culinary Arts Program. Rick became an executive chef at the age of 23 while working at an exclusive country club in the Northwest suburbs of Chicago. He continued to work for private clubs in Chicago, Milwaukee and Detroit, eventually becoming the owner-chef of Miami Bar & Grill in the River North area in downtown Chicago. 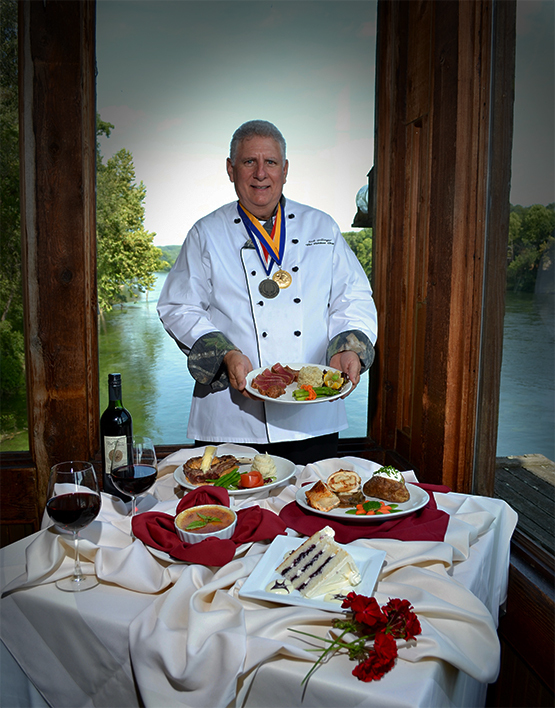 Some of Chef Rick’s notables includes, founding member and former vice president of Wisconsin Club Chefs’ Association; silver medal winner at the Chicago Culinary Salon. Rick also produced and featured in an instructional DVD entitled “The Ultimate Deer Processing Video.” For which, he won 2 Telly awards for instructional videos. Rick is an avid outdoorsman and fly fisherman.